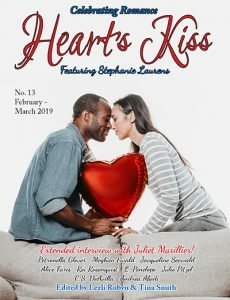 Welcome to our fourteenth issue of Heart’s Kiss, which has enough warmth to thaw the harshest winter. While most of United States was submerged in ice and snow from an Arctic vortex, I was in my native country, Australia, watching a bushfire rage across the countryside near my family home by the oceanside. 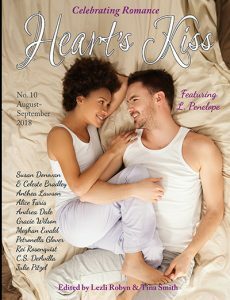 My lovely co-editor, Tina, did a lot of the legwork, swooning over stories our authors were sending us, to select the best pieces for this issue. 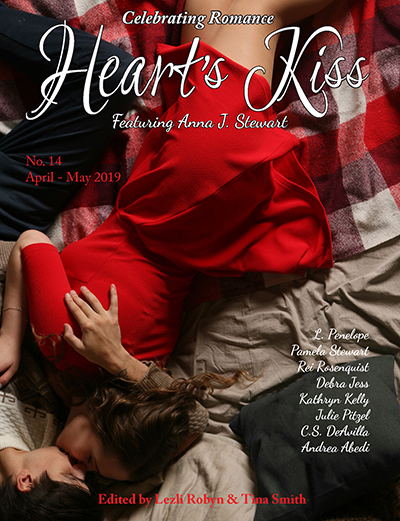 As my twin editor (we have the exact same tastes, to the point of uncanniness), I knew Heart’s Kiss was in good hands while I was unable to work on this issue. I knew that she would pick stories I would fall in love with, and she has! 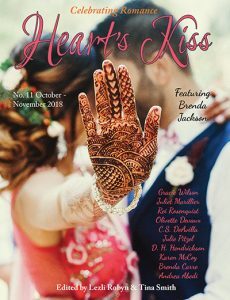 For this issue we decided to go with a more magical theme to help our readers forget the extremes of weather and the stresses of day-to-day life, so we can lose ourselves in fantastical romances for a spell. Our featured author, Anna J. Stewart, returns to our pages with part one of the paranormal novella, Lost and Magic Bound, whose heroine is someone unlikeable you read about in earlier instalments of her Warden in Time series (first published in issues 7, 8 and 9), which goes to show you that not everyone is as they appear at first meeting. Rei Rosenquist also returns to our pages with a fantasy offering, “Rooted in You,” where her characters, Jin and Koda, receive a vision that the Ceremony Tree is about to be destroyed. In a society where only the elders are meant to have visions and age defines who you can love, will they be taken seriously? Debra Jess returns our pages with a science fiction offering this time, “Tomorrow Will Be Brighter,” that also helps me brush up on my Yiddish, and we welcome Pamala Stewart to our pages with another SF offering, “Defective,” about Z43217, commonly known as Zee. She has all the skills of a companion droid, the military expertise of a soldier and what it takes to be a proper spy, but she keeps failing the most simple task of passing for human. She is defective. All she wants is to be chosen, and when she meets Kuta, she finds someone who is the first to treat her like a real girl, even if she has a mission to complete. Will she follow protocol or her manufactured heart? In a departure from our theme—and to always keep our readers delighted by the unexpected—we invited another new author, Kathryn Kelly, to hop under our covers with her historical piece, “Southerners in Blue”, which tells the story about a second chance at love set during the era of America’s Civil War. This fictional romance was inspired by an historical event, the explosion of the Sultana Steamboat, and it is not one to miss. And last but not least, we have more Recommended Books by our reviewer, C.S. DeAvilla, another thirst-quenching recipe by The Temptress Chef, Andrea Abedi, and Julie Pitzel offers up a very thoughtful and insightful installment to her You Read That? column, discussing how women become invisible as they age. So curl up in your red winter leggings, knitted slippers and drink a decadent hot chocolate by the fire (I am, right now!) as you enjoy this next issue of Heart’s Kiss. It’s guaranteed to knock your socks off (or your slippers) and thaw the coldest of hearts. Enjoy! Change of address (paper only).